For years I have been saving photos from my favourite blogs and websites into labelled folders in my computer documents. Weather they were jewellery ideas, outfit inspiration, or makeup looks, I feel like I've been secretly pinning for decades. My inner type A yelped for joy when I first found out about this pretty little site (and app!) where I could offload all of my saved photos, and find millions more to add to my collection. One night I literally spent hours building up my boards, and I haven't stopped since. I check Pinterest almost daily, and I continue to find amazing ideas for now, or for 10 years from now. I'm really conscious of what I'm pinning, and I frequently go through my boards to keep my inspiration fresh. Some of my favourite things to find on Pinterest are at-home workout routines, easy recipes, unique DIY's and home decor ideas. I've had so much fun recently creating some of my own pins too. But my favourite board as of late has got to be my Sweets. It might just be because of the change in weather, but nothing sounds better than a warm banana bread, or fresh crispy cookies. 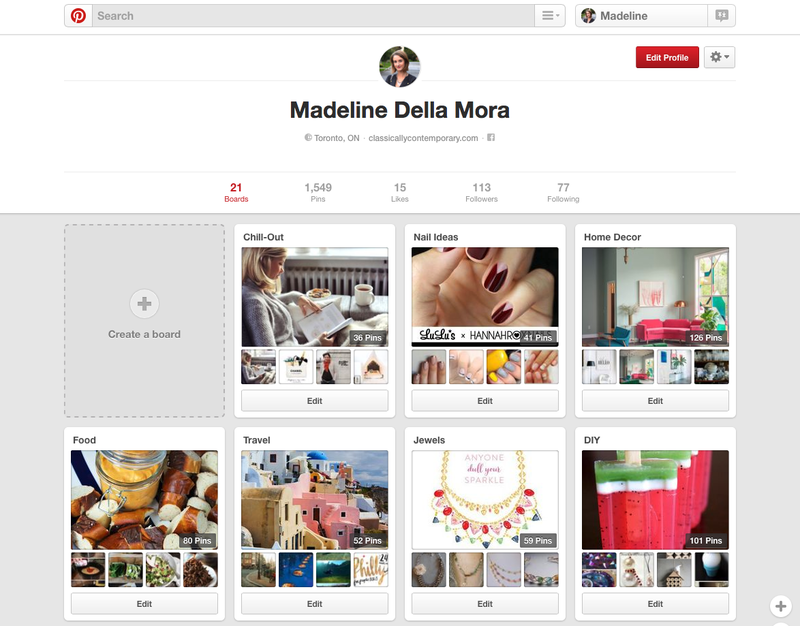 If you haven't already made a Pinterest account, I'd highly suggest checking it out! Click here to see mine. I'd love to follow you back.